Watch LIVE from E11EVEN and ROOFTOP one of the most highly anticipated sporting events of the century as former boxing World Champion Floyd Mayweather takes on UFC star Conor McGregor on Saturday, August 26. 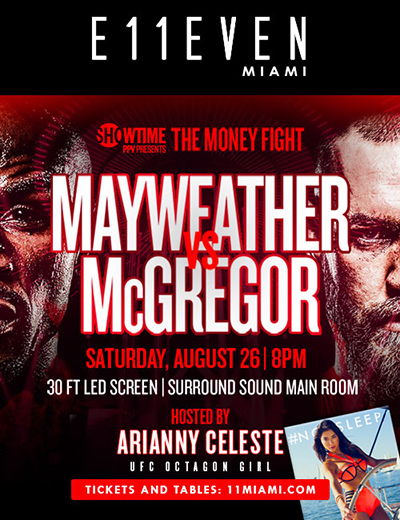 Watch Mayweather vs McGregor at E11EVEN MIAMI on a 30-ft LED screen with Surround Sound Hosted by special guest UFC Octagon Girl “Arianny Celeste” Ticket provides entry to E11EVEN only. Must be 21+ and present valid photo ID. Doors at 8pm. Watch Mayweather vs McGregor at ROOFTOP on Two 16-ft LED screens w/ surround sound. Three Course Dinner package available for $75 per person, Tickets include viewing access from ROOFTOP and/or E11EVEN. Must be 21+ and present valid photo ID. Doors at 7pm.